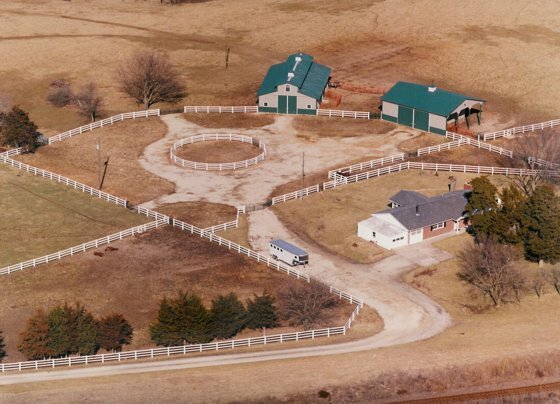 Iron Horse Ranch is a little over 50 acres of rolling highlands just a few miles south of the Missouri River. Our state-of-the-art buildings, in their distinctive hunter green and taupe, with white trim and white cupolas with green roofs, have caused quite a stir in our community, sitting, as they do, right alongside U.S. Highway 50. Dozens (Literally!) of folks have stopped by to ask if they could take a closer look at the construction, and to ask who built them. We always show them proudly, and heartily recommend our builders, HLW Builders, Inc., of Fulton, Missouri, to one and all. 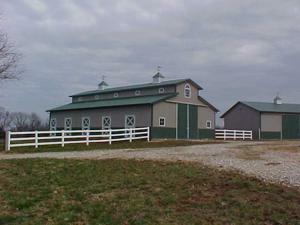 Please visit their web site at http://www.hlwbuilders.com/, where you will also see our barns and read our testimonial. Inside the monitor-roofed main barn, there is a 12’-wide center aisle, with double 12’-high doors on each end, through which a horse-trailer can be driven. There are 7 stalls, each a comfortable 12’ x 12’, giving even a full-grown horse room to move around, and to lie down if he or she so desires. 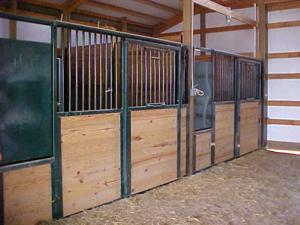 Each stall has a swing-out grain and hay feeder and a sliding door with drop-down “window” that can be opened to allow the horse to look up and down the aisle. We appreciate the quality and service with which our stall fronts were built and installed by Rockin’ J Horse Stalls, of Mannford (near Tulsa), Oklahoma. They do a great job, and you can see them at http://www.rockinjhorsestalls.com/. Tell Rocky we said hello! Finishing off the inside of the barn is a wash rack with hot and cold water, an enclosed feed room, and our “Tack Room,” which is really a small self-contained apartment with ¾ bath and kitchenette. The enclosed areas are finished on the center aisle side with white pine car-siding, which matches the tongue-and-groove lumber that fills the hunter-green stall-fronts. Together, they finish off the center aisle beautifully. Our equipment and hay storage building rounds out the barnyard compound nicely, with the crisp, clean look of its white vinyl fencing, and 60’ round pen in the center.